1. Chop plums into 8 pieces, discarding the stones. Place a pan over medium heat and sweat the shallots with the oil and spices until soft and caramelised. Add the chopped plums, sugar and vinegar. 2. Cook on low heat, stirring occasionally, until the plums are soft. Make sure not to caramelise them – cook for approximately 25 minutes. 3. Remove from heat and allow to cool. 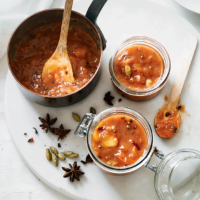 This chutney will keep in the fridge for up to 3 days.